Wessex: close to our home base, and close to our hearts. We invite you to join us and see why – in this tour of a beautiful region of England, which perfectly encapsulates the history and culture of the country. From the ancient chalk downlands of Wiltshire, through the lush tree-clad hills and combes of Gloucestershire to the misty beauty of the Somerset Levels, this is the England of the mind’s eye. We will take you to dramatic cathedrals with soaring spires, serene abbeys, elegant Roman villas and into the deep past of Stone Age England, where it all began. All of England’s history can be seen in this region replete with World Heritage Sites. We begin with the truly ancient landscape of Wiltshire, which still feels indefinably old, even to those familiar with the ancient world. Through encounters with ridge-top sepulchres, the awe-inspiring great stone circles at Stonehenge and Avebury and the strange wonder of Silbury Hill, you will see how humanity passed from the Mesolithic and embedded itself in the landscape in the Neolithic, one of the most dramatic eras in England’s history, and nowhere seen better than here. The depth of our story can be appreciated when even the Celts and Romans arrive only at its middle. Once more, this tour introduces you to some of their finest sites and traces, from the fine mosaics of Britain’s second largest Roman town, through the richly decorated and comfortably heated villa at Chedworth to the pious melding of Roman and British religion in the hot springs of the great shrine at Bath with its strange gorgon-like sculpture. The castles and holy places of the Middle Ages, and the new Kingdom of England, come into view next. We see the powerful castles of the Marcher Lords at Berkeley, meet saints and see a powerful prelate cast down at Old Sarum, and admire the delicate beauty of Salisbury Cathedral, its renowned spire reaching up in adulation to Heaven. Finally, we come to the periods of turbulence and transformation that made our own world as the old religion is broken. At Glastonbury we see a beautiful monastery suppressed, leaving romantic ruins and enduring myth. We see the varying fortunes of the great families, as some fall in Civil War and others prosper and build great country houses, ready to enter the refined and genteel world of Georgian elegance and high society in the respectable, elevated beauty of Bath. All of this accompanied by some fine dining, visits to traditional English pubs, locally brewed ales and ciders and tastes of some of the world famous specialities of the region. At night we stay firstly in a beautiful Italianate-style Victorian country house set in wonderful gardens in the heart of the Wiltshire countryside before heading to Bath and an elegant mansion house hotel on the edge of one of the city centre parks and only minutes away from some of Bath’s most famous sights. From green fields with enigmatic henges, outposts of Roman civilisation in wooded valleys, emblems of Norman power and Georgian taste, there is no finer place to begin your exploration of England’s long and inspiring history. Day 1: Arrivals and transfer to our Country House Hotel in the heart of Wiltshire and on the edge of the North Wessex Downs. Day 2: We rise early for a very special encounter with the beginnings of British history, its most evocative monuments and an experience that will not leave you. At dawn, we will stand within the stone circle at Stonehenge, at its heart, beyond the barriers, and see the sun rise with the trilithons towering over us: a transformative way to enfold yourself in its true scale and feel. We return to our hotel and after time to rest and absorb our remarkable morning, followed by an excellent breakfast, we return to the Visitor’s Centre at Stonehenge, which magnificently explains the monument. Following a fine lunch and then move on to England’s finest concentrations of Neolithic and Bronze Age remains, Avebury. We enter this unrivalled Neolithic landscape at West Kennet long barrow, which looks out from its prominent ridge from behind a great veil of massive sarsen stones. One of the largest and best-preserved of these massive tombs, the dark chambers within were the last resting place for scores of the first generations of people to set roots down here. It overlooks our next, improbable, destination, the extraordinary Silbury Hill, a massive man-made eminence, as old as the pyramids. We follow this with a goose bump-inducing walk to the stone circle along the megalith-lined Avenue, and take in the vast Avebury circle itself, the core of which may be nearly six thousand years old, a very different monument to Stonehenge, but with the same power to awe and its rival in magnificence. We round off a busy day with a visit to the Keiller Museum to expand our picture of its long-gone makers, before enjoying the afternoon exploring in the house and gardens of the attractive Tudor and Georgian Avebury Manor. Day 3: A relaxed start to the day sees us journey into the Cotswolds – one of England’s ‘Areas of Outstanding Natural Beauty’ – and come to the defining type of Roman site, the villa at Chedworth. One of the largest in Britain, enfolding courtyards and a water-shrine within three wings of mosaics and baths, this spacious and opulent home in isolated and beautiful countryside perfectly expressed the Roman idea of refined leisure. After a short drive through the undulating and verdant Cotswold countryside, and a splendid country pub lunch, we reach Cirencester. At the acclaimed Corinium Museum, we see the transformation of the land from the Iron Age through the centuries of Roman occupation. In brilliant modern displays, we’ll find some of the finest Roman mosaics in Britain, and fascinating remains that tell of the daily life of ordinary Romano-Britons at the end of prehistory. An evening meal in a countryside inn sets the seal on the day. Day 4: After checking out of our hotel, we drive to Old Sarum, a site with a very long history. An Iron Age fort, into which the Normans set a castle and richly-decorated Cathedral, both are intimately connected with the dramatic rise and fall of the ambitious Bishop Roger in the Twelfth Century, who was dramatically arrested when at the height of his power. After demolition, the Cathedral was moved to Salisbury, visible in the distance. Old Sarum itself declined, and became one of the infamous Rotten Boroughs, with William Pitt long its MP. A short journey brings us to the lovely town of Salisbury. After seeing some of the finest remains from the age of Stonehenge, we pick up the story of Old Sarum and visit the exquisite and fragile beauty of Salisbury Cathedral. Here we see ‘Magna Carta’ one of the most celebrated documents in English history, and a founding influence on the American colonies and Constitution. Only four copies of the original 1215 Magna Carta have survived the ravages of time and Salisbury Cathedral is home to the best preserved. Afterwards there is free time to have lunch and explore the town’s mediaeval and Georgian splendour. 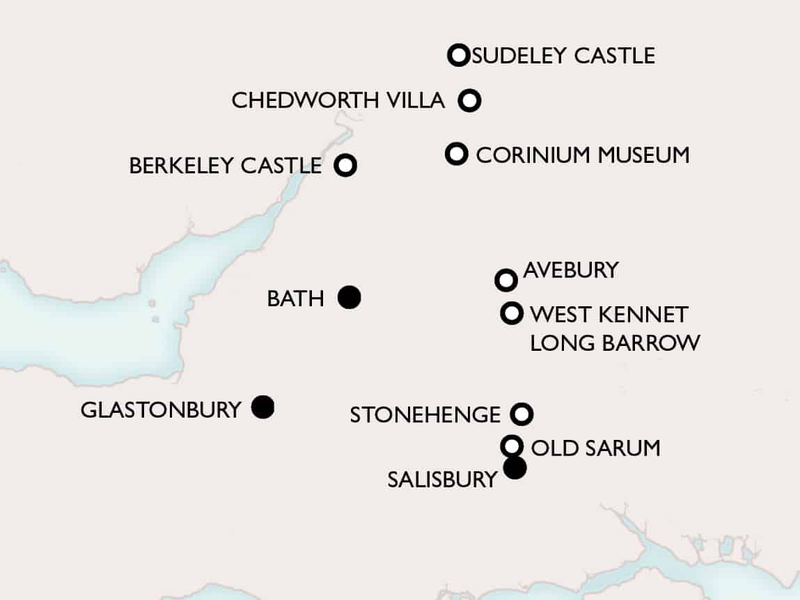 After lunch, we drive to the famed site of Glastonbury Abbey, whose picturesque ruins are surrounded with a haze of mediaeval legends connecting it to Joseph of Arimathea, the Holy Grail and King Arthur, Camelot and The Knights of the Round Table. This wonderfully atmospheric site is a fine way to end the day before we check into our hotel in Bath. Day 5: Today, we visit two large sites which reveal the changing fortunes, lives and taste of the aristocracy from the marcher lords of the mediaeval period through the tempestuous era of the Civil War to the gentility of Georgian Britain and beyond. In the morning, we drive to Berkeley Castle, where the mighty walls of a vast and powerful mediaeval fortress rise steeply from the green surroundings of the Berkeley Vale. The forbidding walls and towers of this great castle mutely testify that this was once frontier country, and that its lords were among the greatest powers in the land, later prominent in the colonial history of Virginia and the East India Company. The great windows show that it has been triumphantly transformed into a stately home. Its thick walls now house tastefully-decorated halls hung with tapestries, fine rooms bedecked with paintings and the great kitchens to service a fine aristocratic home. Outside, the delightful terraces of the pretty gardens designed by Gertrude Jekyll descend artfully and accentuate the castle’s loftiness. Day 6: A whole day in the magnificent World Heritage Site of Bath brings some of our earlier experiences together in some of the most perfect vistas Britain boasts. This exceptionally beautiful city combines a long and extraordinary history with rich connections to some of England’s greatest writers and artists, and a breath-taking sweep of delectable Palladian architecture in warm bath stone with a forest of neo-classical columns. Bath offers the most perfect image of the heights of Georgian sophistication to be seen in the whole country and is a transporting experience for our final day. We begin with a visit to the Roman Baths, where a Celtic sacred spring with naturally warm and sulphurous gushing waters was turned into a vast Roman religious complex, with its famous ‘gorgon’ image, exquisite bronze head of Sulis Minerva and the lead tablets that sought divine aid for those writing them – and punishment for transgressors. We visit the fine modern museum with its extraordinary array of remains, including thanksgiving altars offered by those saved by the goddess’ power, and view the miraculous spring itself, its naturally heated and sulphurous gushing flow still inspiring awe today. Finally, we visit the celebrated icon of the King’s Bath, opened to the heavens in Mediaeval times, the steam now rises skyward from the warm waters. The healing reputation of waters brought Bath a second period of fame inspired by Queen Anne’s visits and the Georgian and Regency Bath of Jane Austen, when the city became a fashionable draw for refined society. Jane Austen lived here for five years and set Northanger Abbey and Persuasion in its magnificent streets, just as Charles Dickens would later use them for The Pickwick Papers. Bath’s position as the epicentre of Georgian taste and society saw Gainsborough join the array of talents in residence. We follow in their footsteps through the ordered and mathematically-perfect yet delightful streets from which it is difficult to choose from among so many superlative highlights. Robert Adam’s perfect Pulteney Bridge, shop clad, spans the Avon and its rushing weir in one of the city’s most pleasing sights. The vast bow of the Royal Crescent, complete with a deep Georgian ha-ha, where the elegant bought measures of frontage to tailor to their exacting requirements, and the serene classical magnificence of The Circus, testify to the rarefied society of this most attractive city. The air raid damage both suffered within living memory reminds us how fortunate we are to experience such jewels and their tremendous setting on this truly memorable day. We have our final meal in one of the city’s best restaurants, an unforgettable way to end a delightful encounter with England’s riches. Our transfer vehicle will collect from Bristol International Airport at 16.30, and Bath Spa Train Station at 17.00, should you wish your arrival at your hotel to be organised by us. If you prefer to arrange your own arrival, check in time is set for 14.30. Check out time is 10.30. We will arrange a transfer from your hotel to Bath Spa Train Station or Bristol Airport, leaving from your hotel at 09.30. Booking Flights The cheapest way to book flights to join this tour in the United Kingdom is directly with the airline online. Visas If you are not from an EEA country you must have a valid passport to enter the UK. It must be valid for the whole of your stay. You may also need a visa, depending on which country you are from. You can check if you need a visa by using the link below. Custom Tours If you are thinking of extending your trip to the United Kingdom to include visits to London, South-West England, Wales or further afield, please contact our office for advice and suggestions for bespoke travel plans. This one week tour provided by PST was exceptional in its content, the itinerary, and all of the support; hotels, meals, tour guides and transportation. PST is an excellent tour company which places the care, comfort and safety of its clients at the forefront. The tour was well organized following an engaging itinerary which was guided by professional and knowledgeable guides. We recommend PST and this tour, Exploring Wessex, without reservation. The Exploring Wessex tour was our first experience with Peter Sommer Travels, plus it was their initial tour to this area. Amazingly, we perceived no “first time” issues, indicating the care with which the company researched the historic sites, the hotels, the transportation and the restaurants. We are pleased to give the company an unqualified "excellent" rating in all aspects, from initial contact, to booking, and finally, to the superb planning and site selection by the tour organizers. We also want to emphasise the deep knowledge, patience and humor of the guides.